Props: PJ Hummel and Sabine Foster. 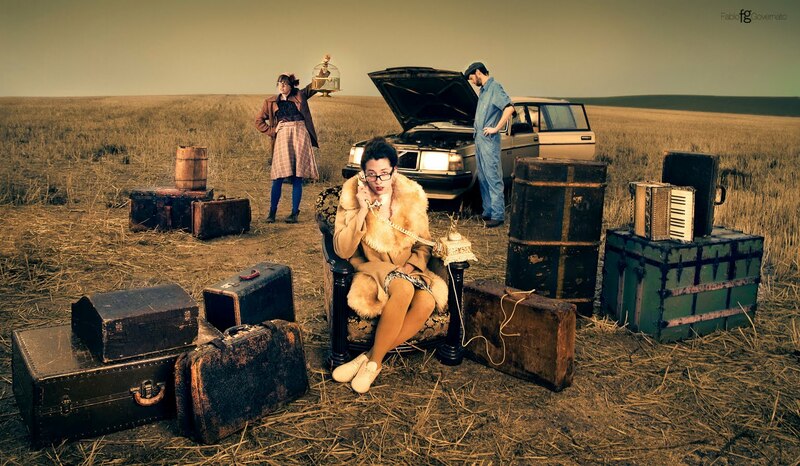 "Stranded", a nod to "Paper Moon" and perhaps to some old Fellini movies took a couple of months of planning (props, vintage clothing, a few items from Anthropologie) but only 45 minutes to shoot. We were on our way to Odessa, WA when I stumbled onto the perfect location. It was getting dark and we "got the image" just before a rain shower poured on the set. A quick affair. Thanks to Laurie Clark and Danny Connors for assisting! Usual lighting scheme: large diffused softbox, next to camera, smaller strobe on Softlighter at camera left.